7/12/12 - Acquisition - Los Angeles, The J. Paul Getty Museum - The 15th century is known as the golden age for illuminations, particularly at the court of the Dukes of Burgundy as proven by the manuscript of the Roman de Gillion de Trazegnies , copied by David Aubert and illuminated by Lieven van Lathem which came up for auction on December at Sotheby’s London, acquired by the Getty Museum for 3.8 million pounds. Produced for Louis de Bruges, Lord of Gruuthuse, a famous bibliophile at the court of Philippe le Bon, it encloses eight illuminated half-pages and forty-four initials with illustrated narratives (ill. 1 and 2). Philippe le Bon, then Charles le Téméraire engaged authors, translators, copiers and illuminators essentially from the southern Low Countries. 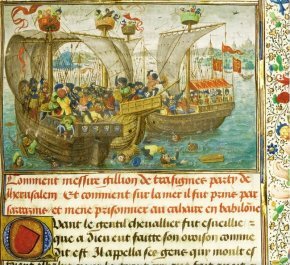 Although books of hours and psalters were of course very important, lay texts, often written in French, considered the cultural language at the time, were much appreciated : epic poems, books of chivalry, accounts of the Crusades as well as of ancient history served to enact political and territorial ambitions. 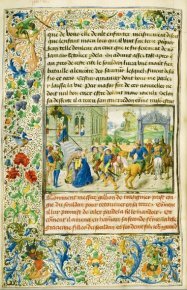 This anonymous prose novel tells the story of the knight Gillion de Trazegnies from an illustrious family in the Hainaut region who, while returning from Jerusalem, was taken prisoner by the sultan of Babylon. The years passed and thinking he was a widower, Gillion married the sultan’s daughter. But his first wife was still very much alive and had given birth to twins who, once adults, set off to look for their father. After various adventures, they found him and informed him that their mother was patiently waiting for him in Hainaut. Gillion returned with his second wife and they all ended up in the convent. Our hero did not remain for long ; called back by the Sultan, he died in battle in the Middle East. Eight large miniatures develop the story depicting war scenes, knights fighting Arabs mounted on camels or elephants, naval battles and the sultan’s court, all with highly animated details and vivid colors. Lieven van Lathem became a member of the Ghent guild in 1454, worked for several years at the court of the Dukes of Burgundy before going to Antwerp in the 1460’s but also spent time in Brussels, Bruges, and the Hague. He collaborated with the Master of Marie de Bourgogne on the prayer book for Charles le Téméraire, also held at the Getty Museum. Van Lathem then served Maximilian I as his personal valet and king’s painter until his death. Published by Stéphanie Vincent in 2010.